I have often wondered exactly what it is about a whale that manages to evoke such an emotional response in so many people. They are mysteriously complex in nature and will certainly never be fully understood, however marine scientists are slowly beginning to decipher some of their traits. What we do know, is that they are highly cognitive beings; they’re sociable, nurturing and resilient. Oh, and some are magnificently large. Whatever it is about them, observing them in their wild environment seems to leave an indelible, feel-good mark on the soul. Our fascination with these gentle giants of the deep has resulted in a thriving whale watching industry throughout the world and seeing a whale in the wild is on many a proverbial ‘bucket list’. 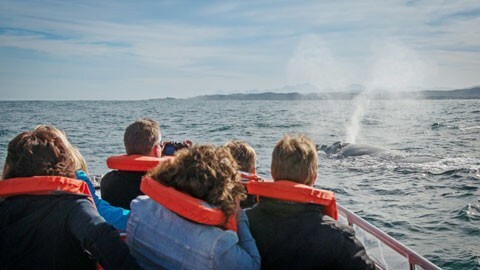 Areas renowned for whale activity draw scores of visitors hankering to have a close encounter whale experience. Knysna is one such place. It is a little piece of paradise blessed with prolific wonders of nature. It encompasses large verdant tracts of indigenous forest, through which a network of serpentine rivers run, all spilling into a large estuary. This iconic liquid landscape then unites with an ocean spectacularly rich in life. Throughout the year a multitude of marine life can be seen here, but every winter and well into early summer, Knysna’s waters absolutely teem with humpback and southern right whales. Following an age-old migratory route that covers many thousands of miles, they skirt our Southern African coastline, moving up north past Knysna. It is firmly on the map as one of the best destinations for whale watching in the South Africa. They come to these warmer Indian Ocean waters from their icy feeding grounds off Antarctica to mate and give birth and so our waters see an abundance of new whale life each year. Knysna’s 2014 whale watching season was an unforgettable one. We were privileged spectators to some of the earth’s most extraordinary creatures. They have now all but left our waters. After many months spent along our coastline, they are now heading back down south to their plankton rich arctic waters, where they will spend the season feeding. And then, they will repeat their migratory ritual. And so we wait, with baited breath, for their return.